Beautifully soft baked donut topped with a maple and pecan glaze! The perfect Canadian inspired treat! 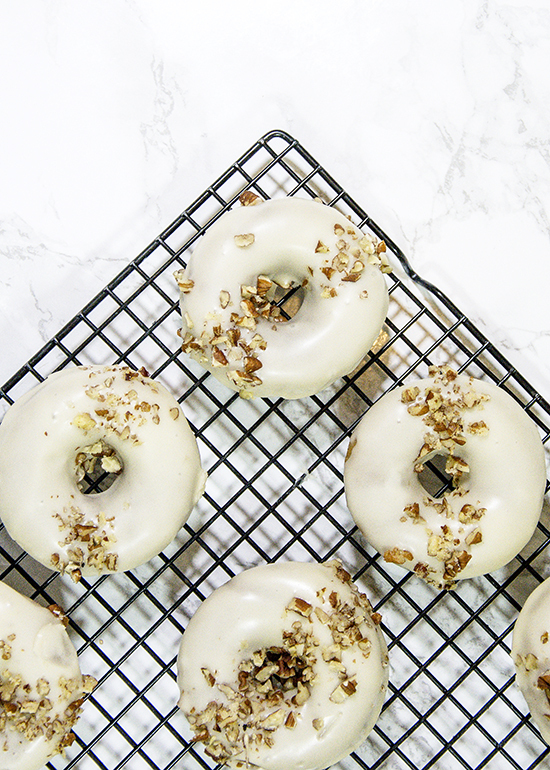 Maple pecan baked donuts! Oh Canada! How can we possibly begin to thank you for giving the world maple syrup? These baked not fried donuts are my attempt at recreating a the classic Tim Hortons maple glazed donut. Okay, back story, Sam loves ice hockey (Go Bruins!) and apparently wherever you find a hockey team in the UK you also find a Tim Hortons, which is mazing for anyone who loves Canada! Our local one in Mancheseter is about a 25 minute drive away so not miles but its pretty far just for coffee, so its more of an occasional treat for us. But we love their donuts and we love their coffee, I use a V60 coffee dripper to make my morning coffee and whenever we visit Tim Hortons we pick up a pack of their coffee but its just not the same without a maple donut!